Pioneer Plaza & Texas Longhorns - Jimmie Aaron Kepler, Ed.D. Located just north of the Dallas Convention Center is Pioneer Plaza. 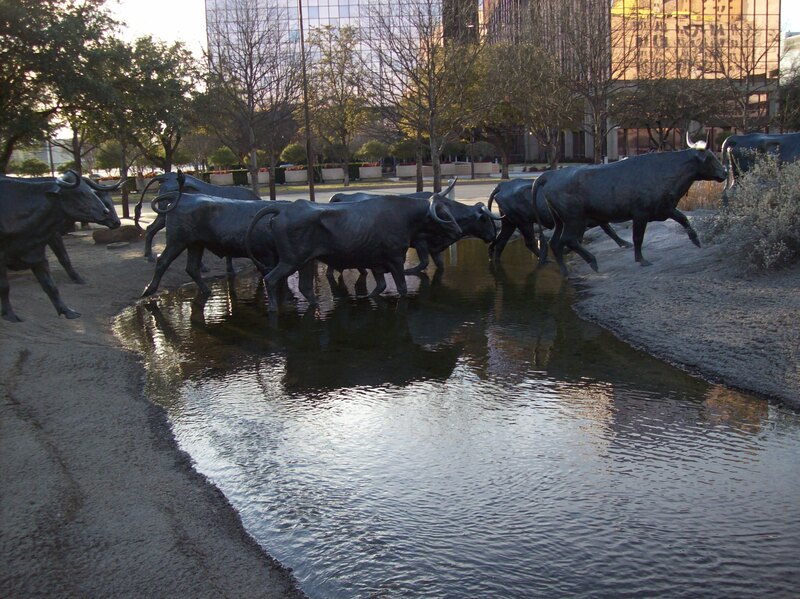 It is a large public park in the Convention Center District of downtown Dallas, Texas. The centerpiece of the Pioneer Plaza is large sculptures. It is a heavily visited tourist site. Located next to Pioneer Park Cemetery, which features the Confederate War Memorial, the two offer the largest public open space in Dallas’ central business district. The land was once railroad and warehouse property. Built on land cleared as part of the failed Griffin Square development, developer Trammel Crow gets credit for the idea behind the sculptures and plaza. He wanted an iconic “Western” sculpture in the City of Dallas. He assembled a group to give the sculptures. The project started in 1992, at a total cost of $9,000,000.00. Built on 4.2 acres of land donated by the City of Dallas, $4,800,000.00 of the cost came from private funds raised from individuals and local businesses. The large sculpture celebrates the nineteenth-century cattle drives that took place along the Shawnee Trail. It was the earliest and easternmost route by which Texas longhorn cattle moved to northern railheads. The trail passed through Austin, Waco, and Dallas until the Chisholm Trail siphoned off most of the traffic in 1867. Artist Robert Summers of Glen Rose, Texas created 70 bronze steers and three trail riders sculptures. Each steer is larger-than-life at six feet high. Altogether the sculpture is the largest bronze monument of its kind in the world. Set along an artificial ridge, man-made limestone cliff the native landscaping with a flowing stream and waterfall creates a dramatic effect. Maintained by the adjacent Dallas Convention Center, Pioneer Plaza is the second most visited tourist attraction in downtown Dallas. Pioneer Plaza by Wikipedia and Jimmie A. Kepler is licensed under a Creative Commons Attribution-ShareAlike 3.0 Unported License. Based on a work at http://en.wikipedia.org/wiki/Pioneer_Plaza. The photograph was taken in Dallas, Texas USA by Jimmie A. Kepler in December 2008. Texas Longhorns in downtown Dallas, Texas by Jimmie A. Kepler is licensed under a Creative Commons Attribution-ShareAlike 3.0 Unported License. Based on a work at https://www.dropbox.com/s/6u5jvbvtdlc08k8/100_1613.jpg.